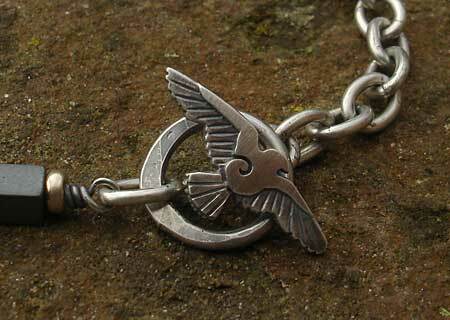 Women's Unusual Silver Bracelet : LOVE2HAVE in the UK! 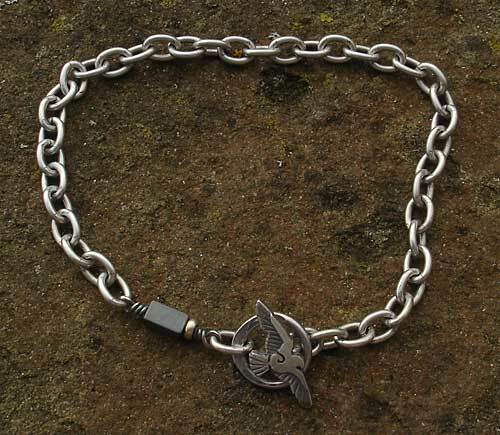 This women's unusual silver bracelet is an excellent example of a ladies or even a men's beaded bracelet from our 'Raven' collection. The Raven is a bird which became famous for delivering important messages for Royalty, demonstrated in such TV series as 'Game of Thrones' for instance. It consists of a sterling silver trace chain with a rectangular hematite bead, a gold roundel bead and a textured Raven catch accent. The piece has an oxidised finish, and the fastening is a T-bar type. The total length is 8 inches long as standard, and other sizes are available on request. Size(s) Available: 8 inches as standard. Metal(s)/Material(s) Available: 925 sterling silver, hematite and gold.